US Secretary of State Mike Pompeo has pledged to introduce the toughest sanctions "in history" against Iran, which he promised would force Tehran to fight to "keep its economy alive." Speaking to Sputnik, geopolitical analyst Alexander Azadgan outlined what he believes is the true message of Pompeo's speech, and its real target audience. Sputnik: What is your opinion about Mr. Pompeo's speech? Alexander Azadgan: Nothing that Mr. Pompeo has said is a surprise. As a matter of fact, when Mr. Rex Tillerson was fired and they brought this gentleman onboard, it's no surprise that he's defending the same old [policy] of the defeated neocons. Of course now we have John Bolton onboard as the national security advisor to President Trump. We pretty much forecasted…basically this old ugly imperialistic image that they're still trying to portray and project onto the rest of the world, not knowing that this model has not worked, that it never did, and now is in its last gasps. Sputnik: What are your thoughts on the reaction that we can expect from US's allies on this issue? Alexander Azadgan: There are two things going on. We have the European Union, which is trying to somehow keep itself together, because it's realizing with Brexit that it's not going to be powerful anymore. The globalists – the internationalists in the EU – want to preserve that model, and they want to pursue their own version of globalism which the US is very much against. 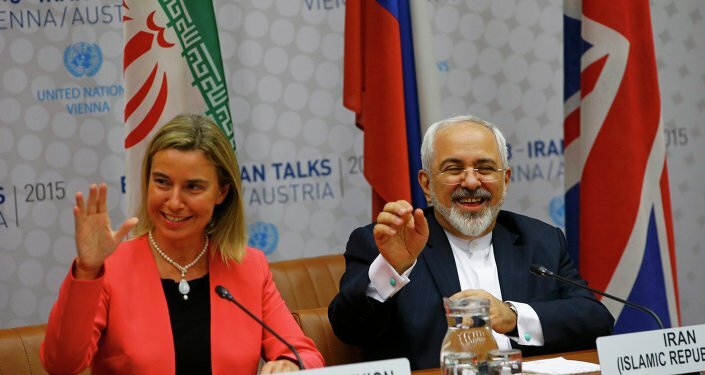 This is a battle of national sovereignty from different levels, because you have to understand that Iran didn't sign an agreement with the European Union; they signed an agreement with three countries, two of which are still in the European Union (Germany and France) and the UK, which is out. So we have that angle – the challenging of the US dollar vis-à-vis the euro, even though the euro was a CIA project from the beginning. American sanctions are really not against Iran; this is something most people don't understand. The United States and Iran have not had any economic or political relations for soon to be forty years. So this is basically punishing any company, whether it's European or Chinese or Russian – whoever they can arm-twist into not doing business with the country. The global community is fed up with that. They don't want dictation from Washington on who they can and cannot do business with. Sputnik: What's this idea that's been floating around about the euro being used by the European Union to pay for Iranian oil? Alexander Azadgan: This could be a declaration of war, or an excuse for a declaration of war by Washington against Iran. Keep in mind that that's what Saddam Hussein was threatening in the early 2000s – to trade his oil in euro instead of dollars; same thing with Muammar Gaddafi with the golden dinar – the common currency of Africa which he had in mind. Many European countries are in a dire situation, so they may really want to promote once and for all that an oil-rich country like Iran would trade its most valuable resources of natural gas and oil in euro, increasing the demand for euro. There's this global effort to really reduce the global dependency on the dollar –we have the petro-yuan system that's being introduced; there are all sorts of movements. Everybody's now waiting to see what kind of severe reaction Washington would show to Iran; everyone is looking at that as a model of how punitive Washington could be against anyone who stands against its globalist agenda vis-à-vis the IMF, NATO, the World Bank – these mechanisms that have been controlling [countries] for the past eighty years, and which allowed the United States to print money and wage wars. Trump Is Playing With Fire as Pompeo Says "We Will Crush Iran"